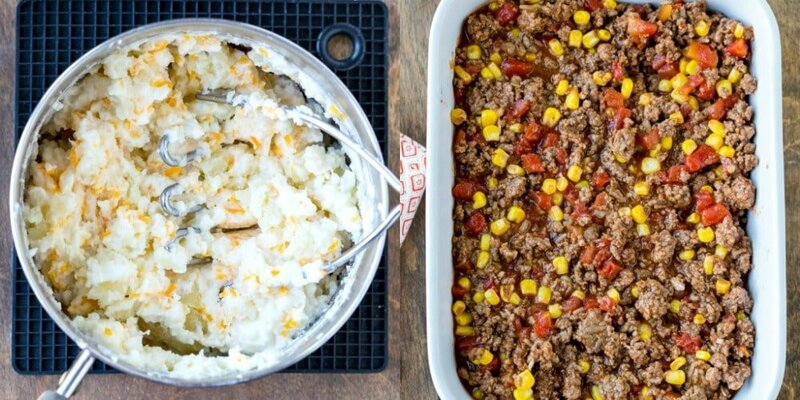 Shepherd’s pie recipe made easy for weeknight dinners! 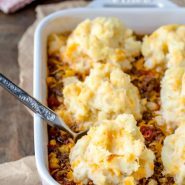 This barbecue shepherd’s pie is shepards pie meets barbecue burgers topped with simple homemade cheesy mashed potatoes. 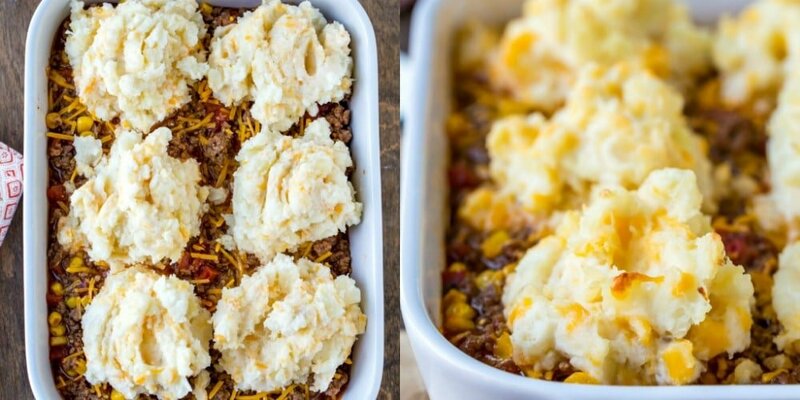 This family-friendly casserole dinner is a great ground beef recipe! Casseroles aren’t the prettiest of foods, but they make yummy dinners! 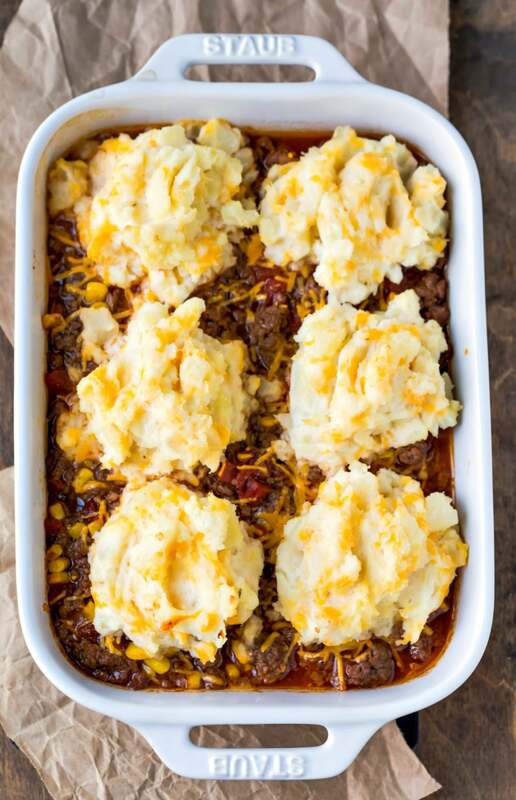 This casserole is one that my family really likes, and it’s on our regular dinner rotation whenever ground beef is on sale. I use a potato masher to make the mashed potato portion. It helps to keep the potatoes from getting overworked and gummy. Use a barbecue sauce that you like. We like hickory or brown sugar barbecue sauces. Sometimes we use homemade barbecue sauce. Just use one that you like because it will provide a lot of the flavor for this casserole. There’s no need to thaw the corn before use. This casserole reheats well, and we like to have leftovers the next day for lunch. More easy ground beef recipes! 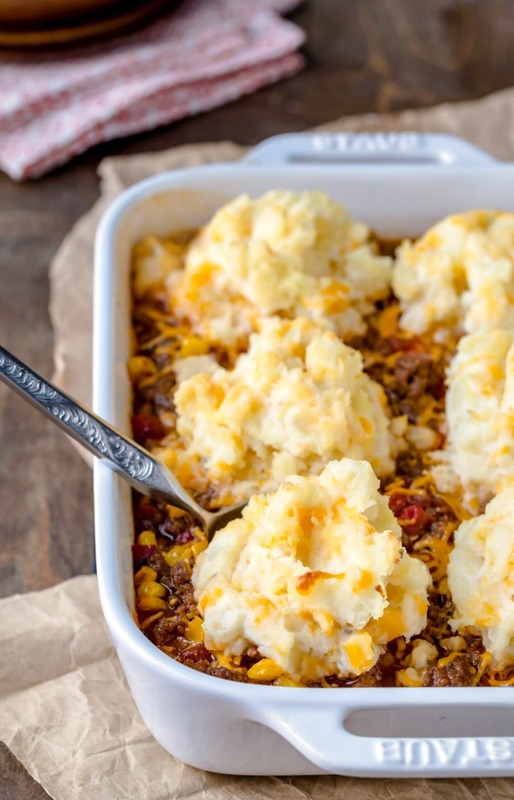 If you’ve tried this barbecue shepherd’s pie recipe, don’t forget to rate the recipe and leave me a comment below. I love to hear from people who’ve made my recipes! You can SUBSCRIBE to receive my latest recipe newsletters or FOLLOW ME on FACEBOOK, INSTAGRAM and PINTEREST for even more delicious food. In a large saucepan cook potatoes in enough lightly salted boiling water to cover for 15-20 minutes, or until tender; drain. Add sour cream, milk, salt, and pepper, and mash to combine. Meanwhile, in a large skillet cook ground beef until browned. Drain grease, and return meat to skillet. Stir in corn, onion, tomatoes with juice, barbecue sauce, spice mixture, and liquid smoke. Reduce heat, and simmer, uncovered, for 5 minutes. Spoon beef mixture into a 2.5-quart baking dish. Sprinkle remaining 1/2 cup cheese over beef mixture. Spoon mashed potatoes in 6 mounds over beef mixture. Bake about 20 minutes, or until heated through and cheese melts. *If you have a seasoning mix that you like to use on burgers, you can use that. Yum! This is going on our regular dinner rotation. This sounds so yum! But while I’m in the process of making this, I noticed the instructions are lacking the onion and corn. I’m not sure when I’m supposed to add them? With the tomato’s? My apologies for not answering sooner! I was traveling today and haven’t had a chance to respond. Thank you for catching that! Yes, you add them with the tomatoes, and I’ve edited the recipe to reflect that. Thank you again!